Fort Magistrate Lanka Jayaratne yesterday enlarged on Rs. 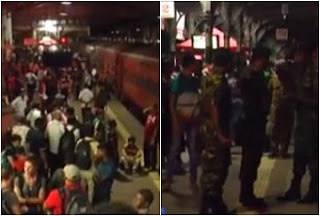 200,000 personal bail an 18-year-old student who had given a false call to police emergency hotline and had the Badulla bound train stopped to prevent her boyfriend from leaving for Hatton. The magistrate severely warned the student and instructed her parents to be more vigilant. The student’s boyfriend had planned a trip to Hatton with a group of his friends on the Badulla night mail on Dec 26 despite protests from the suspect, police said. Determined to disrupt his trip, the suspect had given a false call to the police, claiming that there was a bomb in the train, the court was told. She told the hotline that she was a commuter and overheard two others speaking of fixing a bomb in the train. With the information the police acted fast and got the bomb disposal unit members of the STF Commandos to check the train from one end to another. Police search team ascertained that there was no bomb and commenced investigations to find the caller. Police investigating under the instructions of Colombo DIG Lalith Pathinayake traced the caller and found that she was a student living in Kirindiwela area. She is scheduled to sit the GCE A/L examination this year. The Magistrate said that the girl had committed a serious offence and she would be bailed out as she was a student.